Former Texas Congressman Beto O’Rourke officially launched his presidential campaign last weekend and he’s in Iowa now for a string of campaign appearances. A tavern in Carroll opened early Thursday morning for his first event of the day. “I am getting the feeling, 19 or 20 days into this race, that the people of Iowa take this very seriously,” O’Rourke said, drawing applause from the crowd. O’Rourke began by talking about the flooding in western Iowa. O’Rourke said some of those farmers had stored grain, hoping to sell it later after the Trump Administration settles its trade disputes with China. Lynne Genter of Rockwell City, who intends to review the records of all the Democratic candidates, drove to Carroll to see O’Rourke. 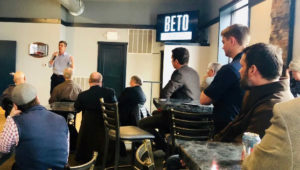 Genter asked O’Rourke about the abortion issue and O’Rourke said he will try to expand “common ground” about women’s health care, but O’Rourke said there are “perverse, unintended consequences” when a woman’s right to choose is restricted. He cited the closure of more than a quarter of the family planning clinics in Texas.